You are an excellent anarchist. A socialite is strangled to death in an unused storage closet within one of Manhattan's iconic hotels. Her murder puts the authorities on edge, but their concern turns into alarm when they spot a calling card on her corpse. The note confirms a sinister cult subdued many years ago has regrouped to try once again to crush the free world from within. Enter Dalton Lee, one of the world's pre-eminent architects. Twenty years ago, Lee brought the anarchists to their knees when he brilliantly deduced who among them had assassinated a congresswoman. With the group resuming its campaign of terror, the authorities recruit Lee and his staff to help them with the investigation, knowing they all now have a personal motive for finding the killer. Can Lee and his team figure out why the fringe group murdered the socialite – and who the murderer was – before New York is under siege and one of their own gets locked within the killer's crosshairs? A short suspense filled the phone line. Then, pronouncing each word with emphasis, "It . . . is . . . done." "You are absolutely certain no one saw you? There's no possibility of your being traced?" "I never guaranteed that. Anything is a possibility." "True, that is very true. Then, would you say you are confident you were not noticed?" "That is something I would say, yes." Another extended silence separated the speakers. Then, a chuckle. "You are an excellent anarchist." "I strive to be." A long pause. Then, an intake of breath. "Except . . ."
"I . . . enjoyed it. I did not expect that." "Don't let it become a fascination for you. It's supposed to be an act of subversion, nothing more." A pause. Then, "I do not think it was the murder that excited me so much as . . ."
"The astonishment in her eyes?" Another pause. To give that comment some thought. "Yes. Astonishment. That was it. She was astonished. I found that part very . . . stimulating." "Let me tell you something. If you are not careful, the thrill of the ambush can become more addictive than heroin." "Good. Make sure of that." There was a click, then silence. Buy Murder Becomes Manhattan from our own independent publishing company, The Cornet Group. Buy Murder Becomes Manhattan for your Kindle from Amazon. Buy Murder Becomes Manhattan from Apple for your iBook. Buy Murder Becomes Manhattan for your NOOK from Barnes & Noble. 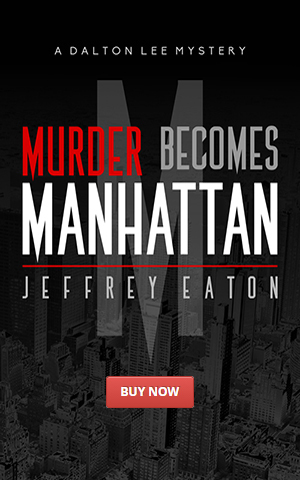 Buy Murder Becomes Manhattan for Kobo eReaders and apps. Buy Murder Becomes Manhattan in multiple ebook formats. "Jeffrey Eaton's first book reminded me of my first taste of Dan Brown – high energy and thought provoking, going beyond a mere mystery to be something also enjoyed by foodies and architecture enthusiasts."